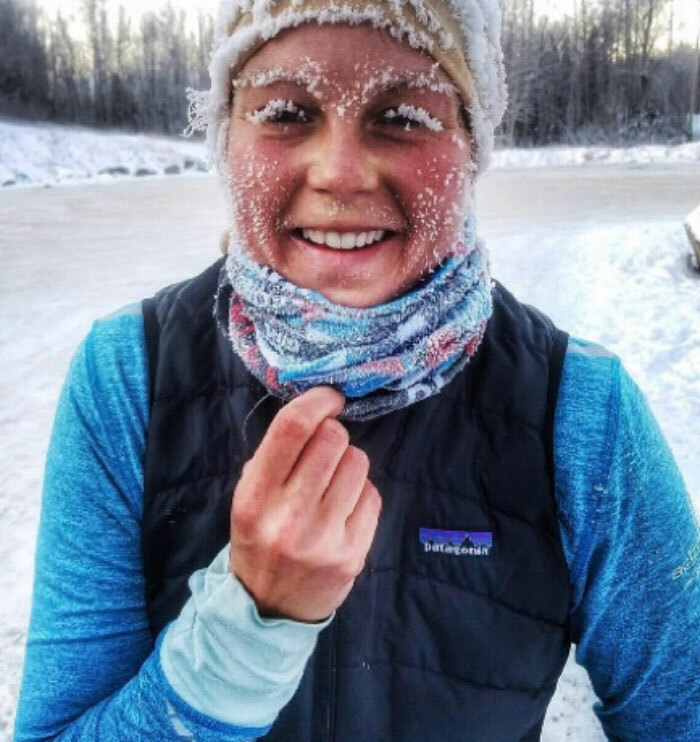 We asked Topo ambassador, Alaska dweller, photographer, adventurer, outdoor guide, fitness coach, and resident cold-weather running expert (phew! ), Kate Arnold, to share her best tips as we wait for the spring melt to happen here at our HQ in Boston. 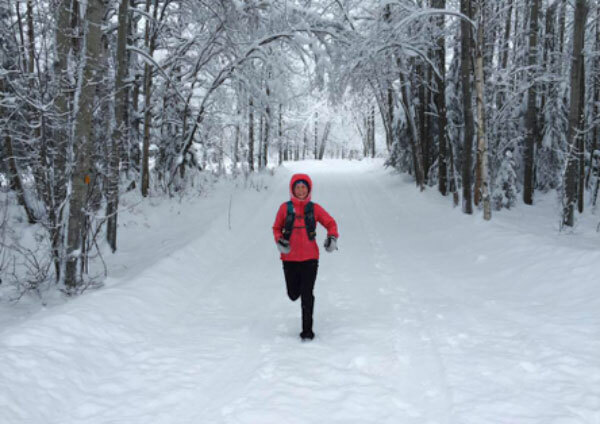 These tips are also top of mind for Kate as she prepares to race the White Mountains 100M in Fairbanks, Alaska, next weekend! 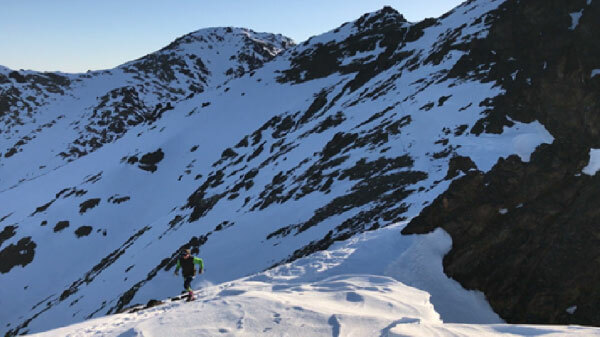 Heavily weigh duration and distance factors: I find it wise to start planning out your gear based on the duration and distance you plan to run since temperatures can change throughout the day and with elevation. You can see the difference in the sample “outfits” at the end of this post. Dress in layers: Layers will help to keep your temperature regulated so you don’t end up overheating and sweating. Sweating in cold temps can be dangerous because it can cause your core temperature to drop rapidly, and worse yet, require you stop to remove layers which increases your risk of hypothermia. If you get wet, don’t stop: Getting wet puts you at risk for hypothermia if you stop, so basically, you have to adopt a “cannot stop” attitude when running in freezing temperatures. HYDRATE: This one is critical – cold weather can dehydrate your body quickly since it needs to work harder in order to stay warm so pay close attention to proper nutrition and hydration with electrolytes. Hydration should be monitored before, during and after exerting energy in cold weather running. Never skip an appointment with your H2O! Take footwear seriously: There are many weather variables that could change the type of clothing that you are wearing, which can be handled by proper layering. However, a variable you will not be able to change while you are out on the trails is your footwear and that is your most important piece of running equipment. Your running shoes can make your run long and successful or cut your run in half due to wet and cold feet. When running in snow, I find it very helpful to have a waterproof shoe like Topo Athletic’s Hydroventure 2 to keep my feet dry and warm. Additionally, shoes like the Terraventure 2(not waterproof) have great traction on the sole to help keep your footing in snowy conditions. Consider your route’s terrain and conditions that day in order to pick the right footwear for the job. 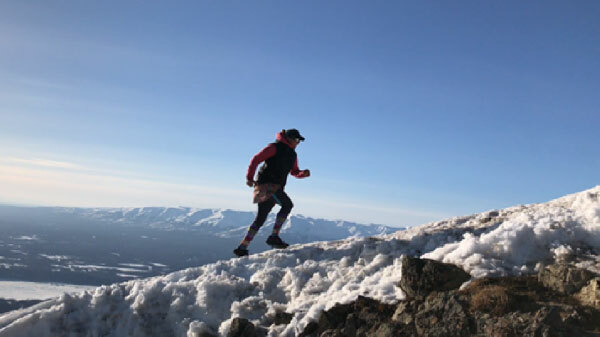 Invest in gaiters: No matter what distance you are running in the snow, gaiters are great to have to keep snow, mud, and water from getting into your shoes and soaking your socks. Topo offers a gaiter that attaches to some of its newer trail models and uses an S-hook attachment system to make sure it stays in place. Wear mittens: Mittens keep your fingers closer together and thus warmer, but you can also wear a pair of gloves inside of a pair of mittens. Keep items close to your body with warmers: Hand warmers are helpful in freezing temperatures for anything you want to keep warm like your hands, water, nutrition, and electronics. Water can also stay warm inside your jacket or you could use a soft flask bottle and cover it with a buff. Practice changing layers indoors: When you’re changing layers outside you need to do it quickly and efficiently in order to prevent hypothermia. Sometimes having a top layer over your running pack can be a good advantage if you know that you heat up quickly; then you can tie it around your waist until you can find a few moments to put it away in your pack. Don’t let the cold scare you away: It takes some extra preparation, but I’ve had some of my most memorable (in a good way!) runs in the snow and bitter cold. There are just no words to describe the beauty of the world blanketed in snow and peacefully quiet. Happy running and stay warm out there!